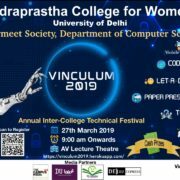 Indraprastha College For Women is ready celebrate Vinculum 2019 with lots of events. 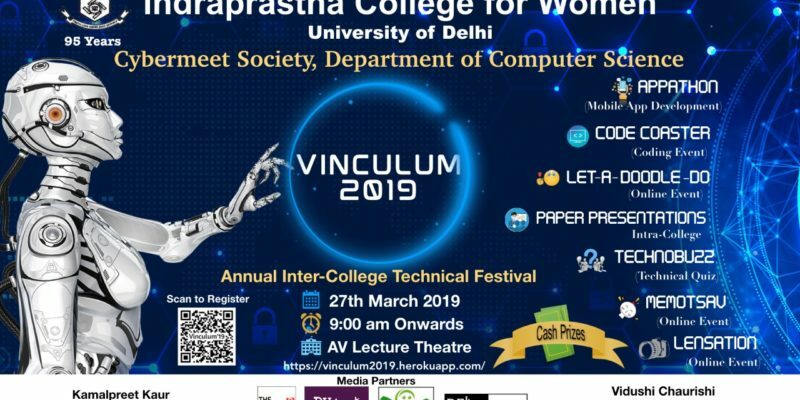 CYBERMEET – THE TECH SOCIETY OF INDRAPRASTHA COLLEGE FOR WOMEN, DEPARTMENT OF COMPUTER SCIENCE trumpets its Annual Technical fest VINCULUM’19, BIGGER-BETTER-BOLDER THAN BEFORE and the most awaited extravaganza of the year 2019. Innovation is borderless and universal! Got innovative ideas? Try them all out! Department of Computer Science IPCW brings to you APPATHON -the free coding event with exclusive prizes and certificate. Themes will be announced on the spot. Participants will be given 6 hours to develop their innovative ideas into an application. The best innovative, as well as creative ideas, wins you amazing prizes. So why to delay and miss the opportunity hurry up and click on the link below! So here we have our online coding competition to showcase the best of your skills and coding talent. The event will consist of 3 rounds. You’ll be judged by your coding & creative skills. Your remarkable efforts win you amazing prizes. So, what are you waiting for?? “Computer Science is the operating system of all innovations”! What are you waiting for?! Unleash your creativity and put your artistic minds to work!! Then come & showcase your knowledge and be a part of this amazing Technical Quiz. The task is to transform the pictures that we will send to you into hilarious memes on programmer’s life, computers, technology, etc. •Entries should be submitted till 22nd March. • OFFLINE: You can register at the registration desk in the college on 27 March. WINNERS WILL GET CERTIFICATES AND SOME AMAZING CASH PRIZES.